Seareq Cutting Tools made of BETA-Titanium – resists salt water and even acids! Perfect for all water sport enthusiasts! The blade of the Seareq Jack-Knife is made of very high-value BETA-Titanium. The BETA-Alloy makes the material very undemanding, it doesn’t require maintenance: To rinse in fresh water or to lubricate with grease after the dive is not necessary. Even when it is stored in its pouch or in the pocket of the BCD during the vacation it does not corrode and does not lose quality! At its top the blade provide a very sharp 50 mm / 1.97 inch long plain cutting edge ends to a 40 mm / 1.57 inch rough wave blade. Behind the rough wave blade a string-cutter is placed at the end of the blade to cut-off thin ropes in a jiffy. The blade can be folded safely into the ergonomic handle. It can be opened with one hand until it is secured by adjustment in extended status. To unlock the knife a lever (also made from BETA TITANIUM) in the knob has to be pushed to retract the blade ("Lockback closing"). High value and very light! The handle is made from high value and very light plastic. The material provides a comfortable surface feel and is shaped ergonomically. Thus the knife feels safe in one’s hand. The power is transmitted to the blade easily by cutting. The pouch is made from robust Cordura, closed with strong velcro. There are several ways to attach it to the equipment and is enclosed in the delivery. As specialist of Safety and Rescue Equipment we care about your safety – in all questions! Therefore we strictly recommend to store and carry your Seareq BETA-Titanium Jack-Knife always in its pouch. The blade of the Seareq Rope Cutter is made from high value BETA-Titanium. Thanks to the first-class BETA-Alloy the material is extremely robust and does not require maintenance: To rinse in fresh water or to lubricate with grease after the dive is not necessary. Even when the Rope Cutter is stored in its pouch or all time long during vacation it does not corrode and does not lose quality! It has a super sharp plane blade positioned safely at the semicircular top. Thus divers can, without risk for them and their buddy, cut dangerous fishing lines or nets even in poor visibility to free themselves. The plane blade ends in a very sharp saw with rough wave blade to cut thicker ropes and hawsers. Cut easily above and under water. Comfortable Grip – even with thick gloves! The Seareq Rope Cutter feels safe and comfortable in one's hand tanks to its ergonomically knob which is made from plastic and additionally covered with velcro. The Velcro enables a soft grip and ensures the Rope Cutter in its pouch. The pouch is made from Cordura and can be attached to the equipment in different ways. It is included in the delivery. Titanium is a very high-value metal. During production the metal develops an "oxydically" protective face which makes it much more resistant compared to steel. This is the reason why Titanium is often used in high technology industries – such as aerospace engineering. But it also used for the production of very high value equipment for extreme sports activities. Compared to steel its weight is approx. just the half but also not so hard. To enlarge the utility value the characteristics of the material of Titanium can be improved by a special alloy according to individual needs. During the process of BETA-ALLOY the chemical elements Vanadium (V), Chrome (Cr) and Molybdenum (Mo) are added which improves the consistency of Titanium immensely. Parallel the material gets a very high flexibility and the resistance to corrosion enlarges because BETA-Titanium resists salt water and even acids. The Seareq Cutting Tools have "Military Standard" and a hardness of minimum HRC 50 (according to Rockwell). 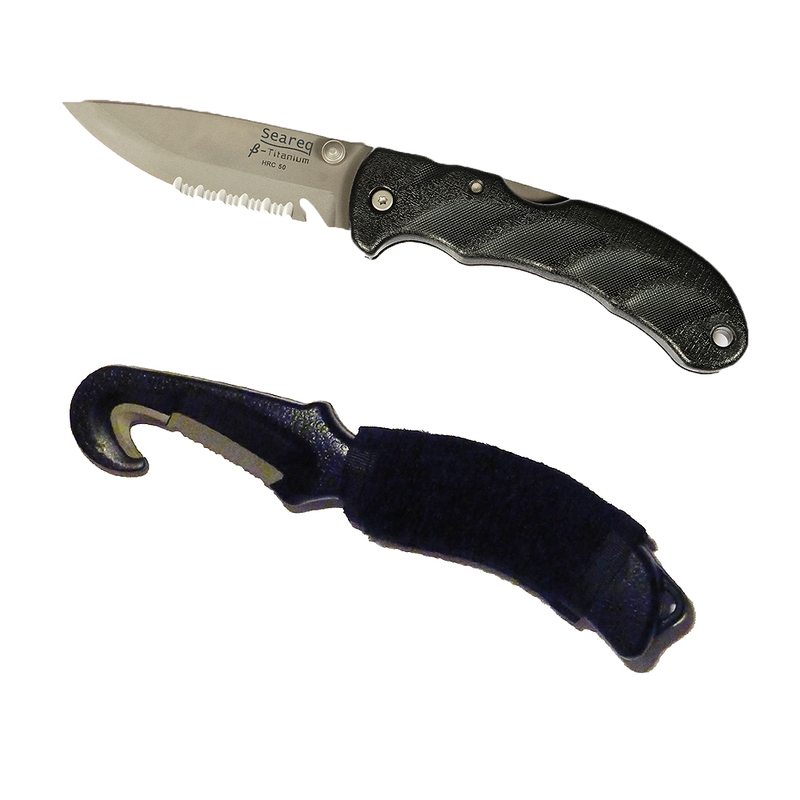 Nevertheless, these knives are expressly allowed for earmarked applications in sports and leisure time such as hunting, fishing, free-/climbing, diving (and many other sports) due to the indispensable and important function. Please pay attention on § 42 a, chapter (2), phrase (3). Therefore nothing stands in the way to use the Seareq BETA-Titanium Jack-Knife responsibly during your activities! If you would like to use the Seareq BETA-Titanium Jack-Knife beyond the earmarked sports applications, take care that the knife is stored and carried in its pouch! Then you do not infringe upon the German Weapon Law because you need both hands to open the pouch and to handle the knife. We wish you every enjoyment and success with the Seareq Cutting Tools made from BETA-Titanium! For your fully information here you find the relevant paragraphs of the German Weapon Law. In case of any question pleased o not hesitate to contact us. (3) Ein berechtigtes Interesse nach Absatz (2) Nr. 3 liegt insbesondere vor, wenn das Führen der Gegenstände im Zusammenhang mit der Berufsausübung erfolgt, der Brauchtumspflege, dem Sport oder einem allgemein anerkannten Zweck dient.